No, this is not Jurassic Park and we’re not actually recreating or cloning our ancestors – just on paper. Back in early 2012, I began to discuss the possibility of using chromosome mapping of descendants to virtually recreate ancestors. Kitty Cooper created the Ancestor Chromosome Mapper to allow people to map the DNA contributed by different ancestors on their chromosomes. It’s exciting to see your ancestors mapped out, in color, on your chromosomes. I utilized Kitty’s tool, found here, to map the proven DNA of my ancestors, below, utilizing autosomal matching and triangulation, to create this ancestor map of my own chromosomes. As you can see there are still a lot of blank spaces. After thinking about this a bit, I realized that I could do the same thing for my ancestors. The chromosomes shown would be those of an individual ancestor, and the DNA mapped onto the chromosomes would be from the proven descendants that they inherited from that ancestor. Eventually, with enough descendants we could create a “virtual file” for that ancestor to represent themselves in autosomal matching. So, one day, I might create, or find created by someone else, a DNA “recreated” file for Abraham Estes, born in 1647 in Nonington, Kent, or for Henry Bolton, born about 1760 in England, or any of my other ancestors – all from the DNA of their descendants. I decided a while back to take this concept for a test spin. I wanted to see a visual of Joseph Preston Bolton’s DNA on his chromosomes, and who carries it today. I wrote about this in Joseph’s 52 Ancestors article. 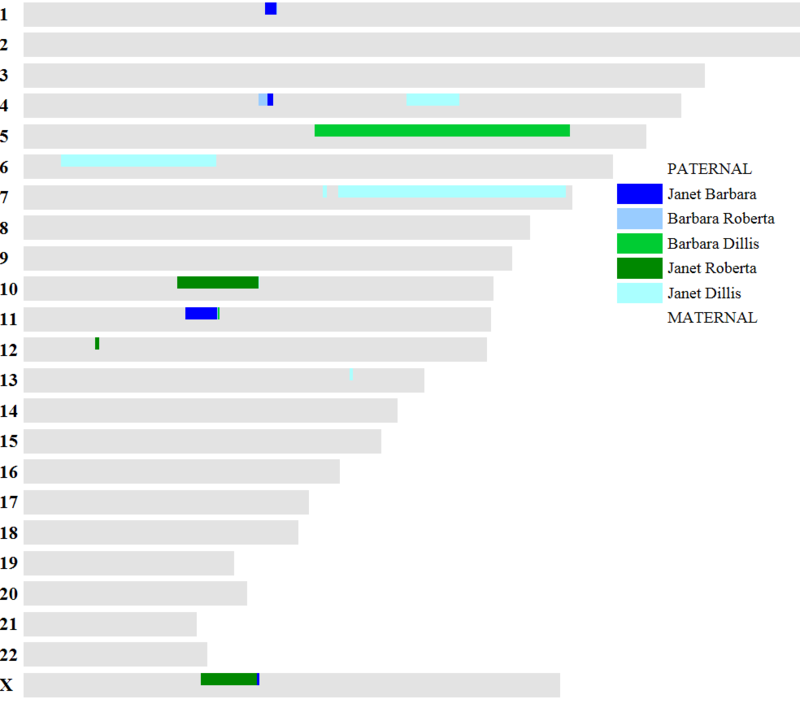 Utilizing Kitty Cooper’s wonderful ancestor chromosome mapping tool, a little differently than she had in mind, I mapped Joseph’s DNA and the contributors are listed to the right of his chromosome. You can build a virtual ancestor from their descendants based on common matching segments, so long as they don’t share other ancestral lines as well. I have only utilized the proven, or triangulated DNA segments, where three people match on the same segment. We have a couple more DNA testers that descended from Joseph Bolton’s father, Henry Bolton through children other than Joseph Preston Bolton. Adding these segments to the chromosome chart generated for Joseph Preston Bolton, we see the confirmed Henry Bolton segments below. On the chart above, I’ve only used proven segments. On the next chart I have not been able to “prove” all of the segments through triangulation (3 people), but if all of the provisional segments are indeed Bolton segments, then Henry’s chromosome map would have a few more colored segments. Clearly, we need a lot more people to test to create more color on Henry’s map, but still, it’s pretty amazing that we can recreate this much of Henry’s chromosome map from these few descendants. There’s a lot of promise in this technique. Henry Bolton was married twice. By looking at the DNA the two groups of children, 21 in total, have in common, we know that their common DNA comes from Henry himself. DNA that is shared between only the groups descended from first wife, Catherine Chapman, but not from second wife, Nancy Mann, or vice versa, would be attributed to the wife of the couple. Since Henry was married twice, with enough testers, it would be possible to reconstruct, in part, at least some of the genome of both wives, in addition to Henry. Now, think for a minute, a bit further out in time. We don’t know who Nancy Mann’s parents are for sure, although we’ve done a lot of eliminating and we know, probably, who her father was, and likely who her grandfather and great-grandfather were….but certainty is not within grasp right now. But, it will be in the future through ancestor reconstruction. Let’s say that the descendants of John Mann, the immigrant, reconstruct his genome. He had 4 known sons and they had several children, so that would be possible. John, the immigrant, is believed to be Nancy’s great-grandfather through son John Jr.
Now, let’s say that some of those segments that we can attribute through Henry Bolton’s children, as described above, are attributable to Nancy Mann. The X chromosome match above is positively Nancy’s DNA. How do I know that? because it came through her son, Joseph Preston Bolton, and men don’t inherit an X chromosome from their father, only their mother. So today, 3 descendants carry that segment of Nancy Mann’s X chromosome. Let’s say that one of the Nancy Mann’s proven DNA segments (not the X, because John didn’t give his X to his son John) matches smack dab in the middle of one of the proven “John Mann” segments. We’ve just proven that indeed, Nancy is related to John. Think about the power of this for adoptees, for those who don’t know who their parent or parents are for other reasons, and for those of us who have dead end brick walls who are wives with no surnames. Who doesn’t have those? We have the potential, within the foreseeable future, to create “ancestor libraries” that we can match to in order to identify our ancestors. Once the ancestor is reconstructed, kind of like reconstituting something dehydrated with water, we’ll be able to utilize their autosomal DNA file to make very interesting discoveries about them and their lives. For example, eye color – at GedMatch today there is an eye color predictor. There are several ethnicity admixture tools. Want to know if your ancestor was ethnically admixed? Virtually recreate them and find out. Once recreated, we will be able to discover hair color, skin color and all of the other traits and medical conditions that we can today discover through the trait testing at Family Tree DNA and the genetic predispositions that Promethease reveals. Yes, there will be challenges, like who creates those libraries, moderates any disputes and where are they archived for comparison….but those are details that can be worked out. Maybe that’s one of the new roles of project administrators or maybe we’ll have ancestor administrators. Someday, it may be possible to construct an entire family tree from your DNA combined with proven genealogy trees – not by intensely laborious work like it’s done today, but with the click of a button. And that someday is very likely within our lifetimes, and hopefully, shortly. The technology and techniques are here to do it today. I surely hope one of the vendors implements this functionality, and soon, because, like all genealogists, I have a list of genealogy mysteries that need to be solved!!! This entry was posted in Ancestor Chromosome Mapper, Ancestor Mapping, Ancestor Reconstruction, Autosomal, Chromosome Mapping and tagged Advanced DNA by Roberta Estes. Bookmark the permalink. Too deep for me, all I have for genes is mine!! No male blood to test and no family members are interested in this. This is great, Roberta! I want to be an ancestor administrator :-)! I’ve actually been thinking sort of along these lines. I’m working on a descendant tree for a third great grandfather, who is a brick wall. My thought was if I could test a descendant or two from each of his children, maybe I could do something with that. I wasn’t sure what, but this tells me! You’re wonderful! My tree has about 800 people in it and I’m only half way through his children … of course, it includes lots of people who are dead, who are spouses (so not really descendants) and who had no children, but with that many surely I can find some to test! Oh man, I love this! I am too stupid to know this: do you need Y DNA for this recreation or just the “regular” DNA? You do have to be sure the people aren’t related to other people “downstream” of the ancestor too. In other words, two brothers or first cousins are going to match on lots of segments that aren’t from a single ancestor. The way to find the ancestor’s DNA is to compare those cousins with someone who descended from the ancestor from another child. On the artsy side of this, The chart makes a beautiful color pattern, wouldn’t it be fun to make a quilt out of one’s ‘ancestor’s mappings”? You own this one, what a brilliant paper that must have been. If I read it, it was before I really started understanding the concept. Is there a link to your original paper? (I’ll go back and see if I missed the link). No, the original paper was not published. So you didn’t miss anything. This sounds great. So how many descendants does one have to test to make it work? Start with what you have. I think I had 5 or 6 to start. I am so thrilled with this article. You have written in this direction before and I have left myself notes to go back and read again, but I think you have gotten to my level this time and on the subject that I am most interested in. We have 34 tests from proved descendants of Thomas Couch b. maybe 1685 and wife Elizabeth. I cannot wait! I thought you could do this already anyway. At least that’s what I was planning on doing and the reason why I am convincing as many of my 1st cousins to get tested and then test our 3rd (and 2nd cousins once removed) cousins in order to see which segments come from specific ancestors. Plus we have half 1st cousin and can easily separate our grandparents’ DNA, map them out. Especially since I found a 5th cousin (one way at least) to my paternal grandmother, so with all the cousins and the 3rd cousins, we can start mapping a lot of these families from my grandmother’s home town of which I have been tracing for 25 years. Put a segment to the ancestors’ names. You can put an ancestor’s name to your segments. But what this does is take all of the ancestors segments from all of the descendants and reconstruct the DNA of the ancestor. I’d like to think WikiTree can contribute a lot to this future. Having a “virtual file” for an ancestor presupposes having a single family tree where ancestor profiles are shared. That’s what WikiTree has been working on since 2008, along with connecting our ancestor profiles to DNA data. I don’t expect WikiTree will be hosting raw DNA. We want to focus on the tree and connect our ancestor profiles to analysis and comparison tools on FTDNA, GEDMatch, DNAGedcom, etc. We’re working with Rob Warthen of DNAGedcom on this now. And, as you know, Roland Arsenault has been developing a plan for DNA profiles of Acadian ancestors. Maybe with your help, the Acadian effort will be a model for the future. It’s wide open in front of us! I’m so excited and with all of us working towards a common goal, you know it will be a bright future. Yes, the family tree is very important, because not only do you need descendants, we need to be sure they aren’t other wise related. I may have to join in on that WikiTree thing. Is this Roland Arsenault the same one on 23andMe? We have matching segments and he shows as 3rd to 4th cousin with my dad. But to know which segment is associated with which of the multitude of common ancestors is baffling to me. How is it done? Sounds very interesting to me. You just start mapping your chromosomes and then little by little, you can narrow which parts come from which ancestors. However, intermarried populations are challenging, like the Acadians. I believe he is the same person as on 23andMe. You can send him a message from your account there. I love your tools Kitty! Thank you so much. GedMatch is a great place for our virtual ancestors to be:) I look forward to your new tools. It’s this a great time to be doing genetic genealogy!!! how did you figure out which segments belong to what ancestor? We know that Henry sailed from London, but we don’t know where his family was from in England before that. London was a city of immigrants from around England and around the world. Wouldn’t that be something! Would love to know where the different matching segments come from. Right now, it is so much work to identify segments, but it’s so rewarding and exciting when you actually do make the connection. So few people that I match with have an extensive family tree. They usually know their parents and grandparents names and beyond that they’re not sure. I tested myself and my parents at 23andMe. It would particularly be convenient for the Cajun/Acadian matches that I have. All of the intermarriages through the years confuse me when trying to identify the contributor of segments of DNA. After I wrote my blog http://allmyforeparents.blogspot.co.il/2014/08/what-dna-came-from-which-ancestors.html back in August, I realized that what I really wanted to to do was to reconstruct certain ancestors and compare them to the “we are probably related” lines. I discussed that with Kitty, whom I had met a couple of weeks earlier, and next thing she produced her “Backwards Use” post. I am having trouble emptying my head and my desk to actually get this done, but it will happen. So much to read and absorb, including this post of Roberta’s. Let me add that your key sentence is “You can build a virtual ancestor from their descendants based on common matching segments, so long as they don’t share other ancestral lines as well.” That clause at the end is where we endogamous people have our greatest challenge. Which is why I was never into this whole chromosome mapping early on because of endogamy, but I’ve been learning how there are still advantages to all of this with endogamy. Roberta, your blog always inspires me! If it were possible, I would quit my jobs and spend a large portion of my life doing only genetic and traditional genealogy! So very many exciting tools and ideas. Thank you for always keeping us informed. I have been doing this manually. I split out the relatives from 23 and me into ones I knew were on my mom’s side and ones I knew were on my dad’s side minus the group that shared DNA from sides. I had a lot more relatives on my dad’s side, so I worked there first. I found a key mael on my da’s lineage that was a close relative that shared half of the x chromosome with me. That helped me to ID that he was from my grandmother’s side since males get their only x from mom. Once I had him as a key I then could split out my relatives out to a set from my grandmother’s side (paternal) and my grandfather’s side. Then I took a screenshot of each our DNA graphics showing overlap and used a graphics program to piece a pink and blue chromosomes map together. My next layer project will be to take it up to the next ancestor up the chain on both sides and split the pink out into where my great grandparents contribute to my DNA. What I came across the article, I was excited to find there was an automated tool. It wouldn’t work for me which is likely a csv formatting issue. I will have to decide if I want to spend the time cleaning up the format of the CSV or keep on using the graphics tool method.